These aren’t your grandfather’s manufactured home. Toss everything you know about manufactured homes out the window, because new constructions break the mold. When we bring new homes to Newby communities we aren’t just adding places to live, we’re adding value to the community. Over time, these homes will help elevate the value of individual homes as well. Currently, we are using the following builders: Skyline Homes (Ocala), Jaconsen (Safety Harbor), and Homes of Merit (Lake City).These quality homes are ushering in a new age of affordable living. Compared to site-built homes, these new manufactured home constructions are greener, produce less waste and are more energy efficient. They include desirable options like high ceilings, open floor plans, stainless steel appliance packages, walk-in closets and granite counters. Builders like Skyline Homes dedicate themselves to quality and consistency. These manufactured homes are inspected frequently during the construction process to ensure they meet federal, state and local standards. Unlike homes built in the past, each home must comply with strict safety standards. 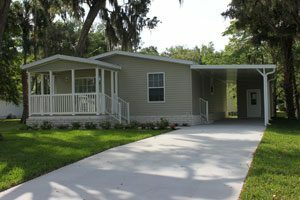 Manufactured homes are built to the Federal Manufactured Home Construction Safety Standards. The HUD code regulates the design, construction, structural durability, transport-ability, fire resistance, and energy efficiency of a home. It also covers performance standards for the mechanical, plumbing and electric systems. Besides being safer and more well-built than older homes, these new constructions appeal to modern buyers. The beauty of the homes are beyond compare. Our new 2015 Skyline Home available in Magnolia Village exudes the quality and design many are after. As you step inside you’re greeted by an open floor plan filled with natural light. You enter the living room and dining area and are lead directly to the kitchen. The eat-in island is perfect for entertaining guests or enjoying a nice brunch. With over 1,400 square feet of living space it’s hard to find value like this anywhere else. This home’s asking price is $83,500. Similar site-built homes in the area are selling for around $150,000 and are often 20-30 years old. 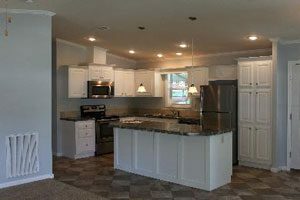 New manufactured homes truly present a fantastic option for affordable housing. At Newby Management, we are excited to add hundreds of new homes to our manufactured home communities over the years to come. It’s an opportunity for us to add value to our communities, but also an opportunity for homeowners to find the value they deserve. We’re giving you a sneak peek at our Guide to 55+ Manufactured Home Communities. Below you’ll find an outline of our chapters, along with part of the first chapter. If you love what you see you can download the e-book for free! Okay you’re looking for a mobile home community, right? You’ve probably scoured the Internet high and low looking for answers to your most basic questions. As if retirement and moving isn’t stressful enough! This guide will help you navigate through the lingo so you can make an informed decision for your future. But first, you’re probably wondering who we are. We’re Newby Realty, a sales division of a full-service property management company, Newby Management, and we’ve been serving mobile home communities in Florida since 1975. You can find homes for sale at www.NewbyRealty.com. We can’t wait to get started and help you along your journey to finding your perfect home. The truth is finding the perfect home won’t happen overnight. If you’re still in the early stages of research you may not even know which state you like yet! That’s perfectly okay; in fact, we think that’s the best place to start. Begin with the bigger picture and consider which state will fit you best in retirement. The options are limitless! Okay, not really, but you do have 50 states from which to choose.